The quintessential Tuscan farmhouse - Podere Chianti sits in a privileged position only 30 Km from Arezzo, Cortona, Siena and 62 Km from Florence. Spacious interiors which are tastefully furnished to a high standard. All bedrooms are en-suite. The pool area is particularly child friendly due to the large, flat lawned area which surrounds it. 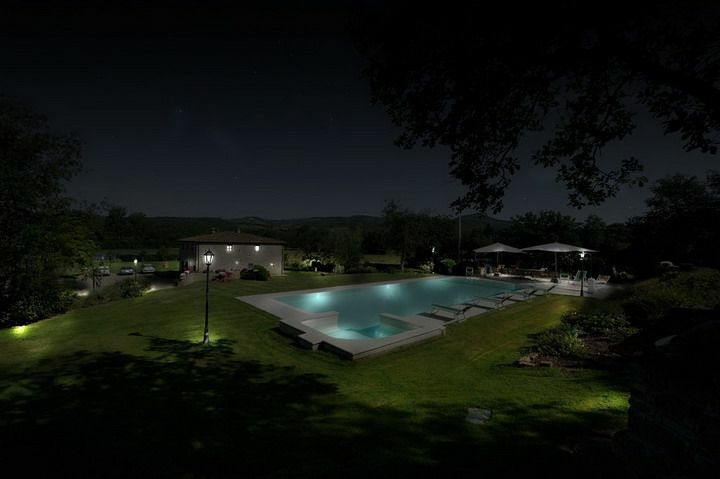 An idyllic retreat ideally situated amidst woods, vineyard and olive trees offering superb views of the surrounding Chianti hillside The villa benefits from air-con, heated pool, a Jacuzzi bath and it's own sauna! Cookery lessons and wine tasting tours can be organised upon request. Bikes at your disposal and horse-riding less than 1 Km. Podere Chianti is the result of painstaking restoration works which have given birth to this wonderful estate, framed by the gentle Chianti hills. The villa, surrounded by woods, vineyards and olive trees, is made up of 2 floors and can accommodate 10+2 people in the 5 spacious bedrooms: one double room with bathroom is on the ground floor, the other 4 doubles are located in the 1st floor of the villa. 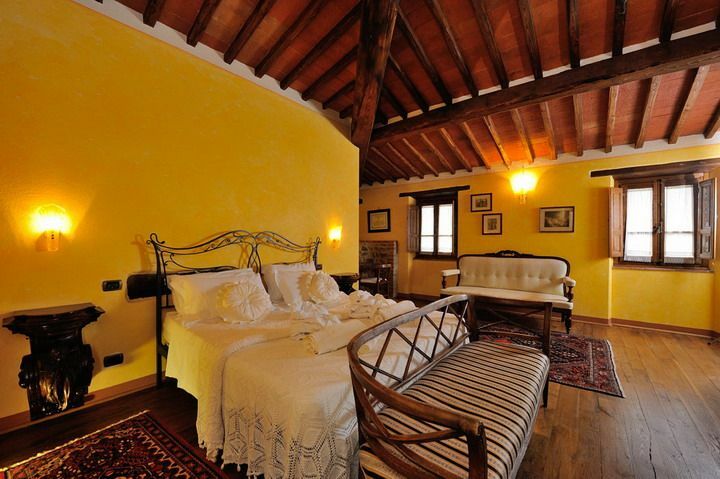 These have been uniquely and elegantly furnished, preserving the typical Tuscan country style though assuring the best comforts. Each room, two of which can host an extra bed, have en suite bathroom with shower or Jacuzzi. A beautiful stone staircase leads down to the ground floor, where a huge living room welcomes the guests. The room is characterized by the warm hues of the sofas which seem to hug the original stone fireplace and by the fine pieces of furniture selected by the owners. A wide brick arch devides the sitting room from the dining room, consisting of a fully equipped kitchen and a big wooden table for 12. The completely equipped garden is ideal for spending some time in complete privacy or for enjoying delicious meals en plein air that you can prepare in the barbecue or in the wood-burning oven and taste in the equipped patio. The huge swimming pool (17 x 6,50 x 1,40m) will allow you to enjoy the peace of the Tuscan countryside while relishing a refreshing bath in the hydromassage area of the pool. Changing rooms and showers nearby. For those who intend to definitely forget the frentic city life, we suggest a break at the wellness centre of the villa: before enjoying a sauna you can relax in front of the huge TV screen. The owners will be glad to offer their guests a delicious farewell dinner prepared with the produce of their farm. Bikes at the guests'disposal for lovely trips through the countryside. Parking place, independent heating, safe, fax, internet, satellite TV. At just 800mt guest will find an equestrian centre that offers nice rides on our hills such us riding school for adults and children. 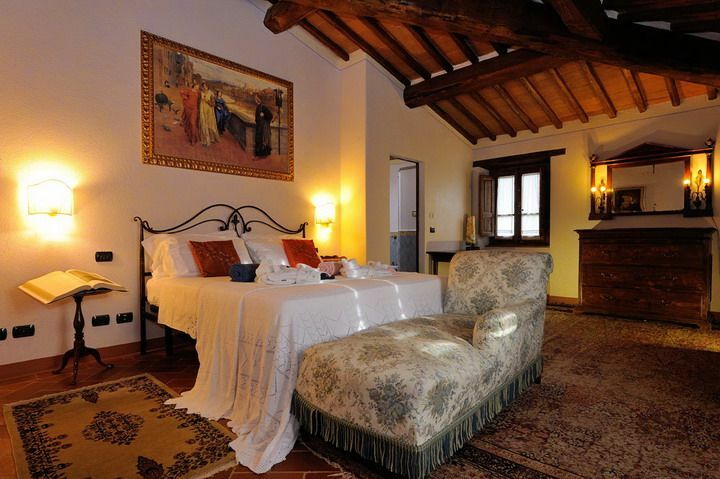 Weekly prices for Podere Chianti are inclusive of a 'pizza party dinner', power and water consumption, bed and bath linens, final cleaning. Air-con is not included - but metered and payable locally. Pool can be heated at extra cost upon request.